The SGMCS servomotor line is designed for direct drive applications where the load is directly attached to the motor surface. Direct drive technology eliminates backlash, reduces the number of mechanical components, and provides a stiff mechanical system for highly dynamic applications. Pre-tapped mounting holes and a hollow-through shaft permit a variety of machine designs. 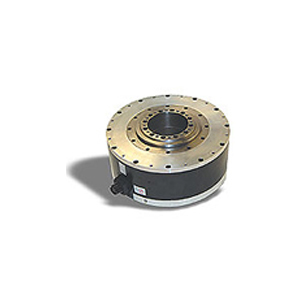 These motors have substantial load carrying bearings, low speed windings, and 1,048,576 ppr absolute encoders. 200 volt windings are available with maximum speeds up to 500 rpm. There are 17 sizes available with up to 5,310 lb-in (600 Nm) of peak torque.